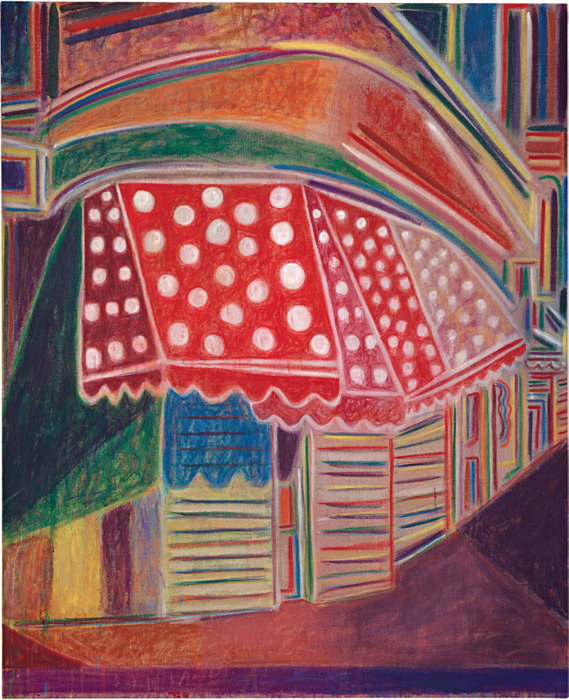 Tal R, Night Awning, 2012, rabbit-skin glue and pigment on canvas, 67 3/4 x 55 1/8". The Copenhagen-based artist Tal R is a catholic sort, having made sculpture, installations, clothing, and more as well as paintings, and having ventured into theater, music, dance, and other fields. His art has appeared in both solo and group shows in New York, but a good deal less often than in Europe, where he has exhibited quite widely. This show, his first one-man outing in New York since 2006, contained a focused group of works made in an unusual medium that he handles particularly well, a mixture of pigment and rabbit-skin glue. Since the glue dries quickly, the artist must work quickly too, and is also less able to reviseto conceal and remove, or layer and addthan an artist using oils or acrylics. The paintings, then, may be something of a high-wire act in the studio, though their appeal does not depend on our knowing this.